We’d love your help. Let us know what’s wrong with this preview of Acts of Faith by Eboo Patel. Acts of Faith" is a remarkable account of growing up Muslim in America and coming to believe in religious pluralism, from one of the most prominent faith leaders in the United States. 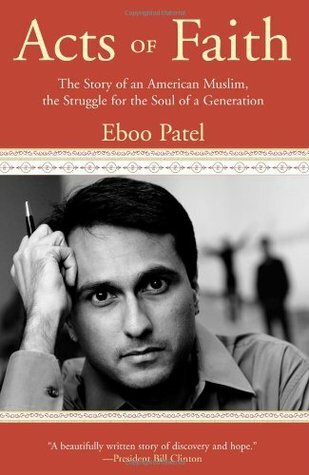 Eboo Patel's story is a hopeful and moving testament to the power and passion of young people--and of the world-changing potential of an interfaith youth movement. "From With a new afterword"
To ask other readers questions about Acts of Faith, please sign up. what is the book's theme? "To see the other side, to defend another people, not despite your tradition but because of it, is the heart of pluralism." Patel writes an excellent memoir of building a movement as he develops his own (religious, political, and social) identity. This is an excellent resource for people engaged with interfaith collaboration, but also for developing leaders in all stripes of social entrepreneurship. He paints a virtual how-to in identifying funding sources, encouraging community support, and sup "To see the other side, to defend another people, not despite your tradition but because of it, is the heart of pluralism." Patel writes an excellent memoir of building a movement as he develops his own (religious, political, and social) identity. This is an excellent resource for people engaged with interfaith collaboration, but also for developing leaders in all stripes of social entrepreneurship. He paints a virtual how-to in identifying funding sources, encouraging community support, and supporting emerging youth leadership. As powerful for interdisciplinary organizers as it is for interfaith organizers. And undergirding it all, he eloquently initiates a call for addressing the threats to peace and progress instigated by religious extremism. This was a fascinating book on several levels: 1) as a memoir of what it is like to grow up in America as an Indian immigrant, 2) a personal journey of faith and 3) an appeal for people of different faiths to dialogue and work together. His vision of religious pluralism is not one that says " all religions are the same and the differences don't really matter.". Instead he has real respect for the uniqueness of each religion, for following ones own convictions, for searching out truth. His vision This was a fascinating book on several levels: 1) as a memoir of what it is like to grow up in America as an Indian immigrant, 2) a personal journey of faith and 3) an appeal for people of different faiths to dialogue and work together. His vision of religious pluralism is not one that says " all religions are the same and the differences don't really matter.". Instead he has real respect for the uniqueness of each religion, for following ones own convictions, for searching out truth. His vision is one where you can dialogue with someone of another religion with respect, while at the same time believing your religion is right and hoping you could convert them - not out of superiority but from genuinely caring that others would know truth. It is a nuanced and engaging vision. He also makes the point many times throughout the book that our early religious influences have a huge impact on us, and can turn the course of our lives, for good or ill. If the voice young people first hear is the voice of violence and extremism, they may turn to violence. He identifies that young people are Ultimately looking for meaning and identity, and it depends on what voices they hear, as to what answers will draw them. He has dedicate his life to building interfaith dialogue that will help strengthen young people's faith and build understanding and friendship between young believers of different religions. Patel is getting a lot of attention for his work, but frankly, it is not because of his writing. This book comes highly recommended not only from people I respect, but with big-name quotes and a major award. The message is stronger than the messenger, which is probably why. Patel is doing good work and he'll let you know that, although he tries to be humble (and fails miserably). The book itself is disjointed. Part of it is about his own life, which can be summarized as upper middle-class kid has Patel is getting a lot of attention for his work, but frankly, it is not because of his writing. This book comes highly recommended not only from people I respect, but with big-name quotes and a major award. The message is stronger than the messenger, which is probably why. Patel is doing good work and he'll let you know that, although he tries to be humble (and fails miserably). The book itself is disjointed. Part of it is about his own life, which can be summarized as upper middle-class kid has the normal tough middle school life, gets into academics, and finally becomes a Rhoades scholar. He tries to sell himself as a "bad boy" at one point, but only looks more upper class as a result. Plus, he cries (actually, sobs) once too often to have ever been too "bad." He puts in story lines but does not finish them, includes random scenarios which do not really tie in (e.g Cat Stevens), and covers most things as superficial level. I actually became angry reading his passive, offend no-one lines beginning with "I believe" (the first thing I tell my students to drop in their writing). I knew Eboo slightly back in college - I was a year behind him, living in the same Residence Hall he talks about in the third chapter. His account of growing up Muslim-Indian-American and how that led him to a career in organizing interfaith youth service projects is both fascinating and well-told. His struggle to integrate the pieces of his identity will feel familiar to many young people of very different backgrounds, and his commitment to encouraging pluralism around the world is inspiring. This book is basically the author's sales pitch for his interfaith group in the narrative form of his extremely multicultural, politically radical life. The structure vaguely resembles a redemption story except that there doesn't seem to be a clear moment of redemption. Perhaps the audience he's addressing is his redemption, just as he promises to redeem their vision of America through his interfaith education program. There is a strong smell of the 1990s: the book faintly resembles A Child Call This book is basically the author's sales pitch for his interfaith group in the narrative form of his extremely multicultural, politically radical life. The structure vaguely resembles a redemption story except that there doesn't seem to be a clear moment of redemption. Perhaps the audience he's addressing is his redemption, just as he promises to redeem their vision of America through his interfaith education program. There is a strong smell of the 1990s: the book faintly resembles A Child Called "It" and Dreams From My Father by his fellow Gen Xers, as well as Lifetime movies. "This is a book," he writes, "about how some young people become champions of religious pluralism while others become the foot soldiers of religious t Really enjoyed this. Patel discusses his own faith journey, describes the birth of his organization (the Interfaith Youth Core, or IFYC), and outlines the need for us to create environments in which young people can explore their faith in pluralistic/interfaith settings. He manages to weave these three threads together into a really engaging story. Nice story, with a genuinely interesting message. Patel is an interfaith youth coordinator now, but his central point isn't that faith always makes people do great things. It's that faith can be a vehicle for violence and intolerance or it can be a channel for service to humanity and compassion, and which path a person takes is completely dependent on early influences. What people want, and especially young people, he says, is a role, a sense of shaping their world. Either path gives it to them. Nice story, with a genuinely interesting message. Patel is an interfaith youth coordinator now, but his central point isn't that faith always makes people do great things. It's that faith can be a vehicle for violence and intolerance or it can be a channel for service to humanity and compassion, and which path a person takes is completely dependent on early influences. What people want, and especially young people, he says, is a role, a sense of shaping their world. Either path gives it to them. Fundamentalists understand that and do a remarkable job of inspiring and organizing young people behind them. Pluralists have every bit the same capacity to inspire and organize, to channel young people's passions into social justice and service, but tend not to be as proactive. He felt that gap in his life and tried to fill it with his work, and the book basically is about how and why. He also doesn't suggest faith has any monopoly on morality. For most of his life, he wasn't interested in faith but was active in community work anyway. He was raised with Muslim rituals he didn't understand, didn't feel any comfort from them when he was alienated as a child, rejected them in adolescence, aligned himself with a sort of intellectual activism in college, got eventually tired of only angriness at the world rather than trying to constructively engage it, then at some point realized his heroes (King, Gandhi, Dorothy Day), whose written beliefs resonated with him, were all people driven by faith, and that even though their faiths were different, the core value that drove them all - service to humanity, without divisions - was the same feeling that drove him. As a young adult he realized that even his own family, though never very good at articulating it, had always lived their faith as that same value. Running through his story are passing mentions of the backgrounds of terrorists and fundamentalists, and how similar and unremarkable they are to his except for some incidental influence at an impressionable age. Patel wonders aloud (or whatever the equivalent is in writing), "What if I'd read (what he read) instead of (what I did)" or "What if I'd talked to (who he talked to) instead of (who I talked to)." His life's work now is to make the influences he found and the path he took easier to come by for those looking. There are several things the author advocates that resonated with me: 1) acknowledging the power of institutions to influence an individual's thought (and thus behavior); 2) focusing on youth as the drivers of social change; and 3) making service the nexus point for dialogue and collaboration. However, I struggle with the author's treatment of the merits of religion, which I found to be superficial. He is right to point out that people can come together by identifying the variety of positive ele There are several things the author advocates that resonated with me: 1) acknowledging the power of institutions to influence an individual's thought (and thus behavior); 2) focusing on youth as the drivers of social change; and 3) making service the nexus point for dialogue and collaboration. It's a good book... yet I felt profoundly misled once I looked outside this book to learn more of the author's Islamic faith. What he apparently is afraid to tell his audiences is that the Ismaili sect of Islam is considered so liberal that many Muslims would say the Ismailis are not Muslim at all. This is particularly astounding given that it was Ismaili's who founded Al Hazar University, possibly the most respected Islamic center of learning on the planet. (It shifted from a Shia/Ismaili base to It's a good book... yet I felt profoundly misled once I looked outside this book to learn more of the author's Islamic faith. Why this is important: the conservative core of Islam can hardly be said to hold the same views as what is demonstrated in this book. I really liked Patel's ideas within this book, but I found it hard to follow/read at many times. There was a lot more history and religious definition that I think I expected from the book. That being said, Patel is an amazing person! He has spoken at my college twice in the last 2 years and has blown me away! It is his charisma, flawless speech-writing, and desire for peace and understanding that drew me to this book. The writing is well-done and I could see bits of his personality shine throug I really liked Patel's ideas within this book, but I found it hard to follow/read at many times. There was a lot more history and religious definition that I think I expected from the book. That being said, Patel is an amazing person! He has spoken at my college twice in the last 2 years and has blown me away! It is his charisma, flawless speech-writing, and desire for peace and understanding that drew me to this book. The writing is well-done and I could see bits of his personality shine through. I really enjoyed hearing the back story about this wonderful speaker and his life-changing program. Patel, an American Muslim of Indian descent, is the founder and director of the Interfaith Youth Core (IFYC), an organization that promotes interfaith service and dialog. Patel makes a case that religious violence (suicide bombings, etc.) can and is being taught to youth around the world, and that if we wish to counter it we must teach youth a different response:an ethic of service that recognizes common values in a variety of religions while acknowledging and respecting the unique paths each tra Patel, an American Muslim of Indian descent, is the founder and director of the Interfaith Youth Core (IFYC), an organization that promotes interfaith service and dialog. Patel makes a case that religious violence (suicide bombings, etc.) can and is being taught to youth around the world, and that if we wish to counter it we must teach youth a different response:an ethic of service that recognizes common values in a variety of religions while acknowledging and respecting the unique paths each tradition follows. One of the most eloquent and empowering accounts I have encountered of an individual coming to terms with their faith, marginalized identities, and the desire to do good in the world. This is an amazing book with profound things to say about religion, youth and civic involvement. I'm going to recommend it to everyone I know. April 2012 update: I reread Acts of Faith this week. Still wonderful, three years later. It is amazing how much this book has positively influenced how I see the world. This book wandered quite a bit. Patel seems to be a self-promoter and often spent long paragraphs in praise of himself. I was hoping for less of him and more of...well, something that was not provided. As I've stated in other reviews, as an atheist, I can't understand anyone being beholden to a religion. Yet I seek to understand why and what others believe. This book did not serve my quest well. Eboo Patel tells the inspiring story of forming the Interfaith Youth Core. He interweaves coming to terms with complex personal identity (in his case, Muslim, Indian, and American) with stories of the transformative power young people of faith can have when they band together for change. The writing is engaging and makes for a quick read. If we are indeed “each other’s harvest,” as Gwendolyn Brooks writes, then we have work to do, and Patel’s interfaith approach makes complete sense to me. As a person of faith, I want to understand other religions and see parallels. Eboo Patel has written an inspiring book about building connections across the world’s religions. He is an American Muslim from India who grew up believing he could not be all three of those things simultaneously. Patel writes “a story of a generation of young people If we are indeed “each other’s harvest,” as Gwendolyn Brooks writes, then we have work to do, and Patel’s interfaith approach makes complete sense to me. As a person of faith, I want to understand other religions and see parallels. Patel made a believer out of me. The striking thing about his young life is that he could have veered into violence or apathy, but random comments by teachers and other influential adults changed his trajectory. His local YMCA picked him for the Leaders Club, and that changed his view of himself. When Patel’s Muslim dad was concerned that YMCA taught him Christian songs, his mother responded, "I hope so. I hope they teach the kids Jewish and Hindu songs, too. That's the kind of Muslims we want our kids to be." Patel writes, “In that offhand reply, overheard when I was a teenager, my mother guessed the arc of my life." Patel describes his college years when he volunteered with the Catholic Workers movement, an unlikely pairing until you realize that this was a kid who was deeply spiritual but didn't have a place for it. His Jewish girlfriend raised his consciousness with the depth of her commitment to Judaism. He told her, "It's just that you feel like you have something to live up to, this Judaism thing. You have these principles you talk about, and this community that watched out for you, and even when it feels suffocating, at least they care for you. I have none of that. I just have some things that I'm interested in and a bunch of groups..."
He re-discovered his Muslim traditions on a trip to India and finally learned where he belonged. Embracing his Muslim beliefs, he came home to start a career forming Interfaith Youth Core. Unfortunately, the 9/11 tragedy occurred soon after. He saw 2nd and 3rd generation Muslim kids who immigrated to America, only to live a dual existence between conservative Muslim homes and permissive Western society. He describes it as “a two-ness, exacerbated by the deep burn of racism.” Patel then went beyond his personal religion and decided to devote himself full-time to building a youth interfaith movement. It struck him that all religions contemplate both peace and violence, and he became convinced that capturing youth while they are young holds the key to the future. In fact, it is the trick used by the proponents of violence; why not use it for peace? “We have before us the glorious opportunity to inject a new dimension of love into the veins of our civilization the end is reconciliation, the end is redemption, the end is the creation of the beloved community.” Martin Luther King. Patel believes the role of institutions, especially religious institutions, will be the determining factor in stopping terrorism. His non-profit is a start. It is a thought-provoking idea. He is describing a world that does not yet exist, but many of us are working for it with all our might. Eboo Patel begins his book by describing the lives of a few individuals who have committed acts of violence, based on their religious beliefs. Early on he describes his intent. "I believe that the twenty-first century will be shaped by the question of the faith line. On one side of the faith line are the religious totalitarians. Their conviction is that only one interpretation of one religion is a legitimate way of being, believing, and belonging on earth. Everyone else needs to be cowed, or conv Eboo Patel begins his book by describing the lives of a few individuals who have committed acts of violence, based on their religious beliefs. Early on he describes his intent. "I believe that the twenty-first century will be shaped by the question of the faith line. On one side of the faith line are the religious totalitarians. Their conviction is that only one interpretation of one religion is a legitimate way of being, believing, and belonging on earth. Everyone else needs to be cowed, or converted, or condemned, or killed. On the other side of the faith line are the religious pluralists, who hold that people believing in different creeds and belonging to different communities need to learn to live together." To make his position perfectly clear Patel immediately notes, "Religious pluralism is neither mere coexistence nor forced concensus. It is a form of proactive cooperation that affirms the identity of the constituent communities while emphasizing that the well-being of each and all depends upon the health of the whole. It is the belief that the common good is best served when each community has a chance to make its own contribution." Patel then makes a very interesting statement concerning religious totalitarians. "Osama bin Laden says that Christians are out to destroy Muslims. Pat Robertson says that Muslims want only to dominate Christians. Bin Laden points to Pat Robertson as evidence of his case. Robertson points to bin Laden as proof of his. Bin Laden says he is moving Muslims to his side of the faith line. Robertson claims he is moving Christians to his. But if you look from at certain angle, you see that they are not opposite sides at all. They are right next to each other, standing shoulder-to-shoulder, a most unlikely pair, two totalitarians working collectively against the dream of a common life together." Patel then adds credence to his premise by way of offering recent examples of how youth have become radicalized to commit acts of violence. He makes the point that while many faith leaders of all streams seem to be unconcerned with their youth, the totalitarian-leaning leaders know how to capture the attention of youth, draw them into their oppressive belief systems, and then radicalize them to become "terrorists" in the name of their respective religions. It is this concern that drives Patel's passion for youth. He points out that, unlike the United States, much of the world's population, particularly in the undeveloped or "third world," are under 30 years of age. And it is this group that religious totalitarians are focued on recruting. Patel's solution is to foster understanding among different faith streams by acts of service. His book details his own faith journey, as the son of immigrant parents from India, and how it led to his founding of the Interfaith Youth Core. Again and again Patel makes the point that interfaith dialogue and action does not include letting go of an individual's particular faith. But it does offer a refreshing alternative to the assumption that all other faith streams are inferior and to be feared. And in fact, such cooperation not only leads to an understanding of another's faith, but most often results in the strengthing of your own. I enjoyed Patel’s biography. I especially admired his grandmother, who saves battered and abused women in India. Some churches could take a lesson from her! However, I disagree with Patel's arguments on religious pluralism. Is “political and theological disagreement” useless? No. Political theology in ‘Abrahamic’ religions is one root of violence. Christians want a theocracy. Muslims want a caliphate. Jews want ‘greater Israel.’ These political theologies inevitably clash. Are all religions alike I enjoyed Patel’s biography. I especially admired his grandmother, who saves battered and abused women in India. Some churches could take a lesson from her! However, I disagree with Patel's arguments on religious pluralism. Is “political and theological disagreement” useless? No. Political theology in ‘Abrahamic’ religions is one root of violence. Christians want a theocracy. Muslims want a caliphate. Jews want ‘greater Israel.’ These political theologies inevitably clash. Are all religions alike? Are values universal? No. True morality is the character of God, revealed in Jesus Christ. Muslim love isn’t Christian love. Islam knows nothing about self-denial or unmerited grace. Judaism (biblical, not Talmudic) foreshadows Christ. Islam defames him. Jesus, the Son of God, died on the cross and rose again. Salvation from sin was and is his message, not service. Patel is right that “human beings were meant to be diverse, and they were meant to live together.” This is what the church, the body of Christ, should be. Some “Christians” (e.g. racists) just refuse to obey. Americans also need to learn how to live in a multi-faith society. This nation isn’t for Christians only. But to think that people of different faiths can “both believe [their] religions are true” and still work together is foolish. “Can two walk together unless they are agreed?” (Amos 3:3, NKJV) This question applies to both divine-human and human-human relationships (friendship, marriage, etc), and the answer is no. Human unity outside Jesus Christ is a mirage. It also smacks of the tower of Babel and the Antichrist. Clearly Patel is more interested in temporal cooperation than eternal truth, which is postmodern relativism. “The core message of Islam is the establishment of an ethical, egalitarian order on earth.” God “chose humanity as his vice-regent on earth with the purpose of creating a moral social order.” This is what Christian and Jewish dominionists want. New World Order, anyone? Patel is a CFR member. This past week I was sitting in mass, attempting to listen to the homily over the loud squawkings of several 3 or 4-year-olds in the congregation, and trying to come to terms with the well of irritation swelling up inside me. I thought, "is there no youth group, no nursery???" and I felt my heart soften as I thought about what this situation must look like to them, barely out of babyhood and aching with a need to run and play while an old man at the front of the room talks about things to which This past week I was sitting in mass, attempting to listen to the homily over the loud squawkings of several 3 or 4-year-olds in the congregation, and trying to come to terms with the well of irritation swelling up inside me. I thought, "is there no youth group, no nursery???" and I felt my heart soften as I thought about what this situation must look like to them, barely out of babyhood and aching with a need to run and play while an old man at the front of the room talks about things to which they can't relate, with words that they can't understand. The author of this book brought up a very interesting point, and one that was only half-forming in my head this week at mass. A good bit of our religious ceremonies, in all faiths, do not speak to children and young adults. Children and young adults are very impressionable (I believe that research says that the myelin sheath around our brains, playing such a large role in the development of our judgment, does not mature until around age 24) and this in and of itself is not anything to be ashamed of -- but it IS a very important factor when considering influences. As is pointed out numerous times in the text, an absolutely startling number of the terrorists who murder innocent people of all faiths are actually quite young -- a good many falling under that magic myelin sheath age, in fact. Patel makes an incredible point -- organizations like al-Qaeda and Christian Identity place a ton of emphasis on youth recruitment, and do youth recruitment very, very well. So why aren't we offering a peaceful alternative, where children are encouraged to explore their faith in a loving setting, and explore the faith (or non-faith) of others? And for those without a faith, why are we not teaching respect for the beliefs of others, while touching on the issues that connect us as a human family in positive ways, such as service to humankind and the planet? The fact of the matter is a lot of young men and women are turning toward terrorism because terrorist organizations offer them a sense of purpose and family that they didn't experience elsewhere. We also are focusing on polarizing ourselves, without sitting down and saying, "well, Eboo, I am not a Muslim and I do not believe that it is the way for me, but I respect the love and service that you give in the name of this religion without strings attached. Bless you on your journey." Young people deserve to be able to develop their identities without fear of repercussion, but also to develop the respect for other faiths so that others can continue on their journeys unimpeded. Eboo Patel wrote this book as a memoir of sorts, and one of the things that impressed me most is how it also delves into the realm of apology at times too. Patel frequently confesses his own shortcomings in empathy, and his own knee-jerk prejudices when remembering the formation of the Interfaith Youth Core. I probably can't express the level of comfort this brought me -- I personally struggle with own my feelings toward the "deserving poor," and "God helps those who help themselves," not exacerbated in small ways by the fact that I've gone from a two-term AmeriCorps worker and non-profit Jill of All Trades to law enforcement office worker. If I may be so brash in saying so, though I'm grateful for my pension, 401K, health insurance, and salary, I'm concerned about what the collective mindset of my office has done to my sense of charity and forgiveness. I'm also concerned about what that means for me in the future, as I parent a child with -- I sure hope-- a deep sense of compassion, generosity, curiosity, and respect for humanity's rich colors and textures. On that note, I am wondering more about my own country, my own culture within that country. Patel talks a great deal about atrocities perpetrated against various groups by opposing groups, and let me tell you -- the Muslims have taken their (un)fair share of it. Point blank, we do not hear enough about Muslim points of view, diversity among Muslims, Muslim history, and and all of these omissions lead to the birth of Islamophobia and ethnocentrism. Young Muslim men and women feel alienated and oppressed by the west, they lack opportunities to connect in positive ways (Interfaith Youth Cores, please!) to the people of the west, they naturally turn to a place of solace against the racism and oppression they've felt, a place of belonging and family, which frightfully so can be the welcoming arms of a terrorist organization. This segues into something that's been bothering me, as well. Inciting negative opinions of American policies and practices without actually getting your hands dirty to change them. This is outright pointless negativity, and I will tell you something -- nothing makes me angrier than seeing someone whining about the status quo without actually participating in the change (2016 elections, anyone?). In a moment of epiphany, Patel states, "...my students at El Cuarto Ano were experts on inequality. They didn't need to hear from me that the hand that they got dealt was unfair. What they needed was somebody who could teach them basic, useful skills: algebra, reading comprehension, essay composition. Then they would have what my suburban education gave me: the tools to make up my own mind about the world around me. I began wishing that my professors had spent a little more time lecturing on how to constructively engage the world as it is and a little less time teaching me how to criticize it." Patel goes where you'd expect, urging us to put aside our differences, hold hands, and pursue the common good together. He's clearly very educated, and tries to be teachable, but ends up as one of those folks whose minds are *too* open: everything he puts in is in danger of falling out. This was 2017's One-Book Villanova. Patel is speaking on campus next week. Maybe I'll get to ask him a question. Honestly reading this book felt really healing to me in some ways...it was just nice to immerse myself in the writing of someone who is deeply committed to pluralism and diversity and the ways that those values can benefit communities. I’m not very religious, but this book...almost made me want to be? At the very least it definitely inspired me to embrace the community around me and find ways to serve it, which I think is an important feeling to have right now. I read this on the recommendation of two colleagues, and was not disappointed. Patel is a very confident and insightful young man who does some great social analysis about what makes young people turn from a solid productive faith to a radicalized destructive religion. I actually marveled at his insights that I found were beyond some of the wisest and most mature faith leaders I know. Don't let the details about politics dissuade you from keeping on through this book. It's worth the read. This book is the One Book Villanova selection for this year. Eboo Patel is well educated and details how the Interfaith Youth Core was created. He explains that many of the radical individuals who have been suicide bombers and terrorists were just ordinary youths who were influenced by religious totalitarians. Eboo believes that if youths could instead be religious pluralists that there would be peace. The goal of the Interfaith Youth Core is to connect faith, social justice, and diversity.